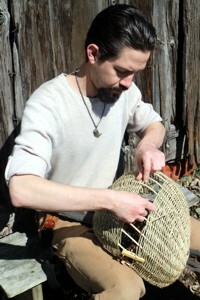 Steven was exposed to basketry at an early age with the influence of his mother, Mary Carty. However, he did not take it up as a trade until adulthood when he became a professional basket weaver. Though he often tends to drift away from traditional styles and patterns, he does use many traditional and local materials which he gathers from the wild. Much of his weaving inspiration comes from the very land he gathers some of these materials; the creeks, forests, and shores of South Jersey. Not only can Steven's baskets be found in homes across South Jersey, he himself can be found weaving at various local festivals or teaching children basket weaving classes. Though he handles most of Pinelands off-site basketry business, many of Steven's baskets can be found for sale there. He can also be found teaching classes there.